Companion/Pet or Show prospect? What's the difference? Breeders will often ask, "Pet or Show?" to determine your intended purpose for the puppy. Responsible Breeders breed with the goal of improving each generation, striving to move ever closer to the perfect sheltie described in the official standard. A breed standard is a written description of aesthetics, character, and structure of what a member of the breed should conform to. Its often compared to a blueprint. The breeder uses genetics and research to breed the right combination of individuals to produce healthy, sound individuals that conform to the standard. A show prospect needs to have these qualities in abundance plus the right attitude to compete against other show prospects in a contest to determine which dog shown on that day comes closest to that written standard of perfection to be awarded points toward a title of Champion. A full description of the rules and requirements for Championships & Conformation shows can be found on the AKC website. The breeder reserves these individuals for homes where other dedicated "keepers of the breed" will show and only use these prizes of a breeding program for further improving the breed. Pet or Companion "quality" often only differ in degrees from the show prospect, maybe its size or shape of the eye, but still have the qualities to make the dog a lovely and loving companion. Because the breeder has determined that these dogs do not have the specific virtues required to improve the breed, you will be required to spay or neuter so that your companion is not bred and does not face the possible health risks of intact animals (prostate & mammary cancers, pyometria, undesirable behaviors, etc.). Pets can excel at many activities: of course, as a loving companion, or a service or therapy dog, or dog sports like obedience, agility, flyball, herding, Frisbee, etc..
With any dog you buy, seek out a breeder you can trust and will be there to answer questions and support. You should expect a puppy from parents that have proof of health clearances for hip Dysplasia, eye anomalies, & VonWillebrand Disease (vWD), at least. The breeder should also know about any history of seizures or skin diseases in the pedigree of your new dog or puppy. These things are not guarantees that your dog will not ever suffer from a health issue, but is the best possible assurance that the breeder has taken every precaution to minimize or eliminate the risk. As a buyer/home you are expected to provide a safe, healthy loving home for the dog you are entrusted with. Regardless of price, pet or show quality, a dog is a precious life, and not a possession, that deserves a home with caring responsible owners. As a breeder, I am looking to place my dogs only in homes that will provide the best quality of life for the dogs I have dedicated so much of my life to. I reserve the right to decide which homes I place my dogs into. The following dogs are available to the right homes. All homes must have comfy couches, soft beds, adoring humans, Adults require fenced yards. All are, or will be neutered or spayed, unless otherwise noted. I reserve the right to refuse any home. 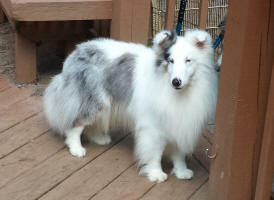 Double Merle white male: Moby. Born 6/8/2011. Sweet male with good vision. He is hearing impaired so requires a special home willing to work with a deaf dog. Uses the dog door. Is crate trained. Moby loves everybody, gets along with other dogs, has a sense of humor and is easy going with grooming. He's such a happy guy you can't help but love him! Fenced yard only. Please check the Puppy Gallery for potentials that may be available soon.